Happy New Year 2019. May all your hopes and dreams be fulfilled. Malaysia Vacation Guide is the place where you will be able to find the information of the various attractions that the beautiful country of Malaysia has to offer. This year is an exciting year for tourism in Malaysia. We are expecting over 30 million tourists to visit Malaysia this year. Many promotional activities have been planned by Tourism Malaysia and tourism related agencies for you to enjoy your stay here. See the tourism events 2019 and join an event or two during your stay here. Malaysia accommodation and hospitality are among the top in this region. There are many budget and 5 Star hotels that you can choose to stay during your holidays here. In general, the room rates are more expensive during the public and school holidays. If you have the flexibility of time, use Malaysia vacation guide to plan your itinerary so as not to coincide with these days. See the Malaysia 2019 holidays. Compare the hotels rates before making your bookings. Coming to Malaysia is easy as the international airports in Kuala Lumpur, Langkawi, Penang, Kota Kinabalu and Kuching serve more than 40 international airlines. To our foreign visitors, Malaysia Vacation Guide wishes you "Selamat Datang" Welcome to Malaysia. To fellow Malaysians, "Let us continue to make Malaysia Truly Asia A Memorable Experience To All Our Visitors". If you are planning to buy tour packages during your travel in Malaysia, check and make sure that the company is a registered travel agency. You can check at the Ministry of Tourism and Culture Malaysia official website here. White sandy beach of Redang Island. The long coastline of Peninsular Malaysia with Straits of Malacca to the west and South China Sea to the east provides many choices of beaches and islands for visitors to choose their holiday destination. Some of the beautiful islands are Redang Island, Tioman Island and Pangkor Island. Langkawi Island is a duty free island which is more developed compared to the other islands of Peninsular Malaysia. It is also the venue of Langkawi International Maritime and Aerospace Exhibition (LIMA). There are many Langkawi hotels that you can choose to stay while you are here depending on your budget. The island of Borneo where Sabah and Sarawak are located also boast of a long coastline with South China Sea to the west and Sulu Sea to the east. While in Kota Kinabalu, visit Tunku Abdul Rahman Marine Park and you will enjoy the abundance of fishes here. The world renowned Sipadan Island, a diving haven is located at the Celebes Sea to the east of Sabah. The view of Sungai Palas Tea Plantation. The mountains of Malaysia are the places where many go to escape the heat of the day. 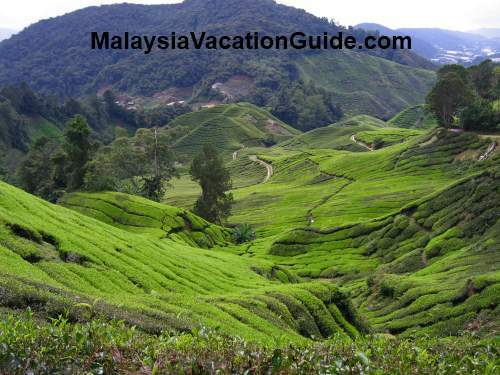 The highlands that are developed for tourism include Cameron Highlands, Genting Highlands and Bukit Tinggi. As the mountains are high in altitude, the temperature varies from 16 °C to 24 °C hence an ideal place to go for a time of relaxation..
Apart from that, the greeneries and the mountainous landscapes that abound in the highlands make many nature lovers come back again. As for theme park on the mountain, there is Genting, the City of Entertainment which is located in Genting Highlands. If you prefer to go to a less developed hill, Maxwell Hill or Bukit Larut in Taiping is the one that you can go to. There isn't any 5 star hotel here but bungalows and rest houses for accommodation. Fraser's Hill is another hill which is still pristine and not so developed. Activities here include bird watching, hiking, golfing, archery, horse riding, picnic by the waterfalls and boating. If you like adventures, there are mountains to climb. Try climbing Mount Tahan, the highest mountain in Peninsular Malaysia located in Taman Negara. Not to be missed is Kinabalu National Park in Sabah, the entrance to scale Mount Kinabalu, the highest mountain in South East Asia. A view of KL City Centre from KLCC Park. As in any cosmopolitan cities, Kuala Lumpur and its surrounding boast many towering skylines such as Petronas Twin Towers and Kuala Lumpur Tower. Blended in is the historical Sultan Abdul Samad building, built during the colonial time as well as Chinatown, the bargain corner bazaar of Malaysia. Not to be missed are the various shopping complexes that offer discounts and value for money items for you to bring back. While at the city, there are many Kuala Lumpur hotels ranging from budget to 5 Star hotels that you can choose from. International hotels that are located here include Crown Princess Hotel, Kampachi Equatorial Hotel and InterContinental Kuala Lumpur. If you are in transit and would prefer to stay at hotels near KLIA, the Pan Pacific Hotel is one that you can stay. Other hotels in the vicinity of the airport are De Palma Hotel and Concorde Inn. For backpackers and budget constraint travelers, staying at the many inns, motels or hostels in Malaysia is another option that you can take. The multiracial society of Malaysia comprises the ethnic groups of Malay, Chinese and Indian in Peninsular Malaysia. In Sabah and Sarawak, the indigeneous group comprises of Kadazan Dusuns, Ibans, Murut amongst others. Visitors can see for themselves how the various ethnic groups live together in harmony. You can get souvenirs made by the local people in the various tourist destinations. 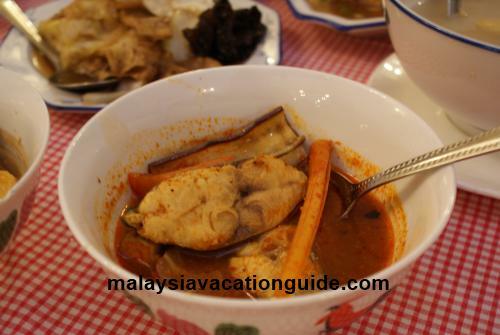 This Malaysia Vacation Guide home page is not able to describe the many things and attractions that one can do in Malaysia.. so do browse through the various links in Malaysia Vacation Guide and discover the magic of Malaysia. Malaysia vacation guide site will be updated from time to time with new tourist spots and destination, so remember to check back here occasionally. If you have benefited from this site, let others know about this Malaysia Vacation Guide site by bookmarking at your favourite social bookmarking system. If you find Malaysia Vacation Guide site useful and would like to contribute your travel stories to be included in this site, you are most welcome to submit your story here. Your comment on the content of Malaysia Vacation Guide site is most welcome.